I love Greece. Maybe it’s because when I was a kid I was really nuts about Greek mythology. Maybe it’s because I went on vacation there after months seeing nothing but Arabian and Egyptian deserts, so I was in desperate need of someplace a little cooler and greener. Maybe it’s because Greece was the first place I ever went on vacation with the nice lady who would, a while later, agree to marry me. Or maybe it’s a little of everything. Anyway, I love Greece. 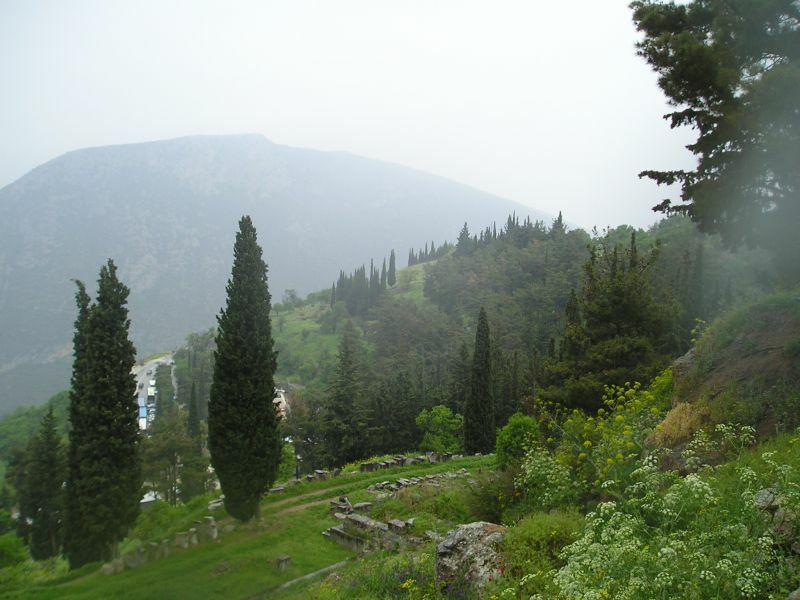 These pictures are from Delphi, home of the world-famous Oracle where the priestess of Apollo was said to predict the future (after a nice donation, of course), and today a UNESCO World Heritage Site. 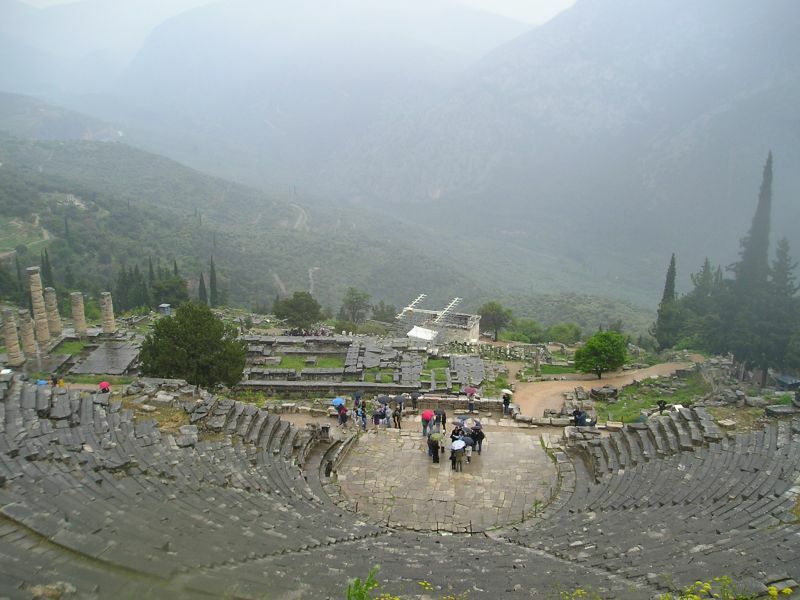 We were staying in Athens with no thought to leaving the city until our planned visit to the island of Santorini (Thira) later in our trip, but then I saw an ad for a bus tour to Delphi and we booked it the next day. 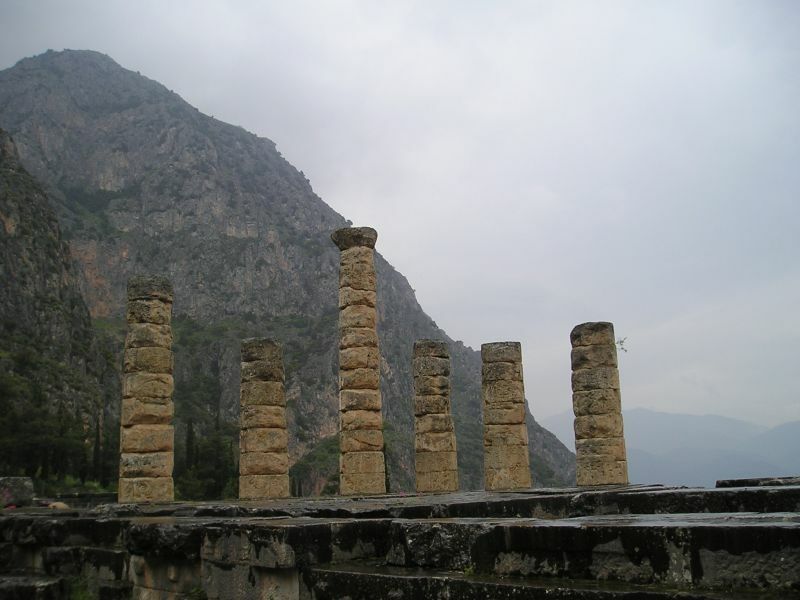 Aside from the chance to walk in the ruins of a place that was once one of the focal points of Greek religion and culture, it turns out that Delphi is just really gorgeous. It was lightly raining the whole time we were there, but after you’ve spent enough time living around deserts you realize that rain is uncomfortable, but it’s also pretty irreplaceable as far as getting some damn plants to grow. 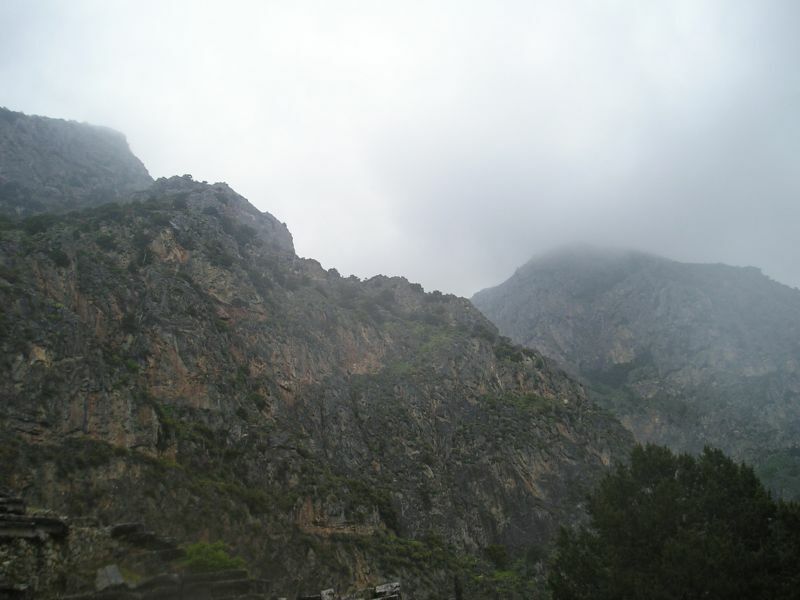 The site itself just hints at the grandeur that must have existed there once; earthquakes have taken their toll over the millenia. 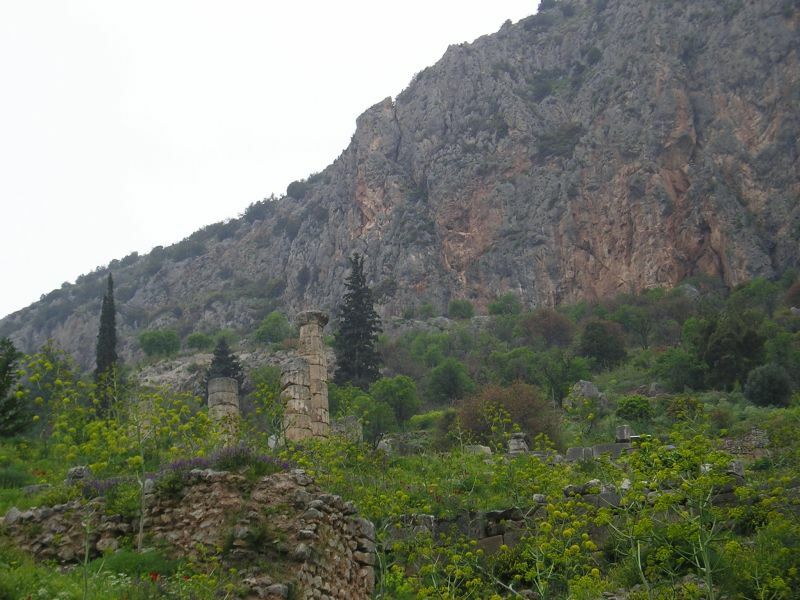 Also not helping preservation: in medieval times the village (known then as Kastri) was located right amidst the ruins, and residents reused the ruins and their materials to build and repair their houses. 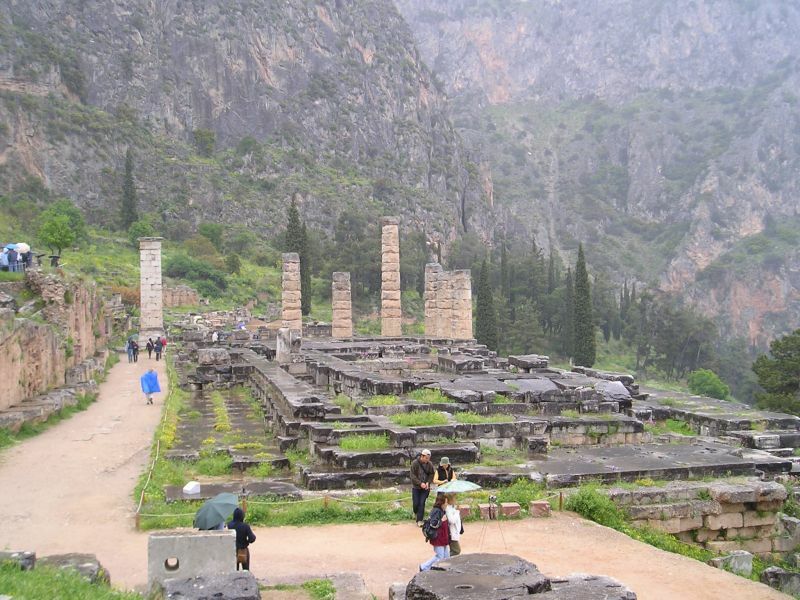 It wasn’t until the very end of the 19th century that residents were convinced to relocate to the modern town of Delphi, just west of the ruins, and then only after another earthquake had wrecked the town and they were offered free new homes if they agreed to move off of the site. 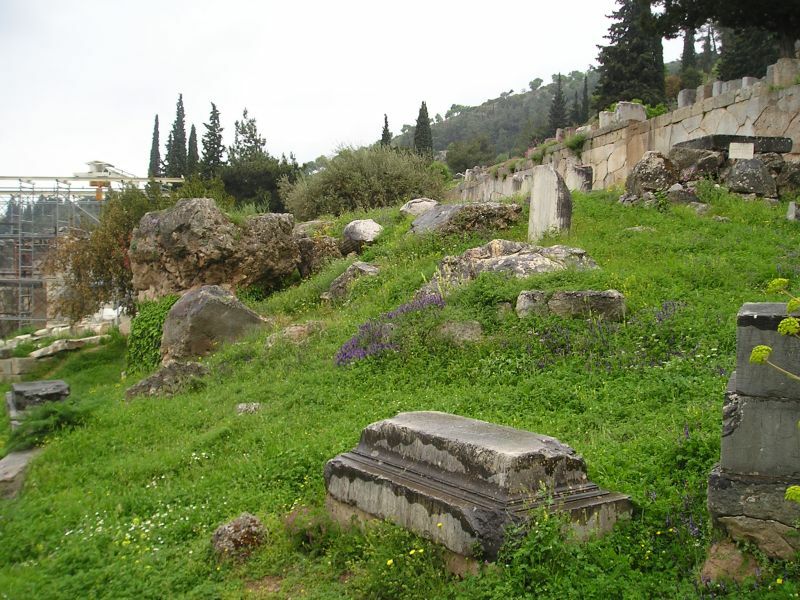 The Sybil Rock, that large natural boulder in the center-left with the ivy growing beneath it, amidst some other ruins (back part of the Temple of Apollo on the right). 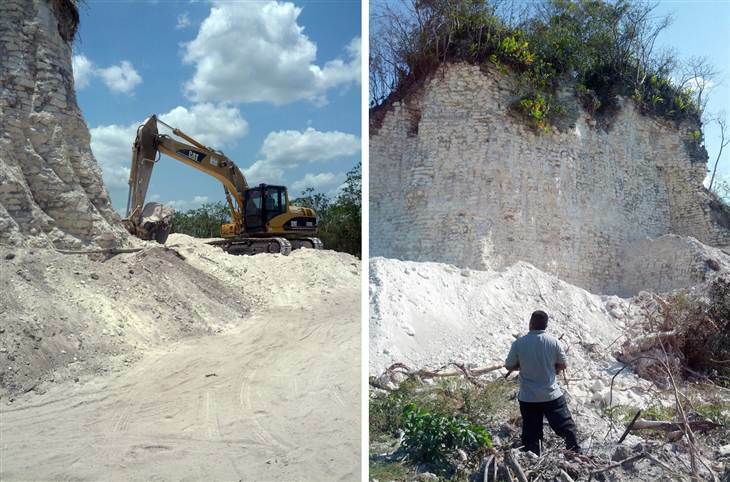 These are the images of what remains of a 2300 year old Mayan pyramid, at a site in the north of Belize called Nohmul, that has been destroyed in order to be reused as gravel by road paving crews. 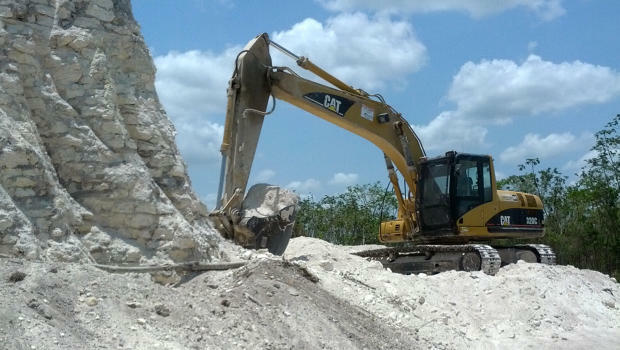 A construction company in Belize has been scooping stone out of the major pyramid at the site of Nohmul (meaning Big Mound), one of only 15 ancient Maya sites important enough to be noted on the National Geographic World Atlas. 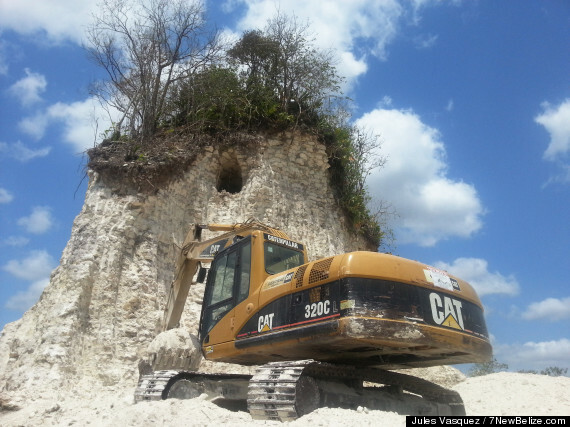 But now it appears that nearly the entire main pyramid, once standing over 60 feet tall, has been destroyed by road building crews, said John Morris, associate director of research at Belize’s Institute of Archaeology. The institute is a department of the Belize Ministry of Tourism and Culture. This is simply unconscionable. I find this kind of destruction even more heinous than what has happened to Syria’s heritage during her ongoing civil war, or the ongoing destruction of Sufi shrines in North Africa by Salafi fighters. They’re all horrific as far as I’m concerned, but there’s at least an explanation for the latter cases that can be understood on some level. Wars happen, as much as we might wish they didn’t, and things are damaged and destroyed in war, as much as we might wish they weren’t; there is no justification for the destruction, but it is at least understandable. Salafi teaching, whatever one may think of its merits, tells its devotees that shrines are an affront to God and must be destroyed; again, there’s no justification for what they do, but it can be understood if seen in the proper context. But this? 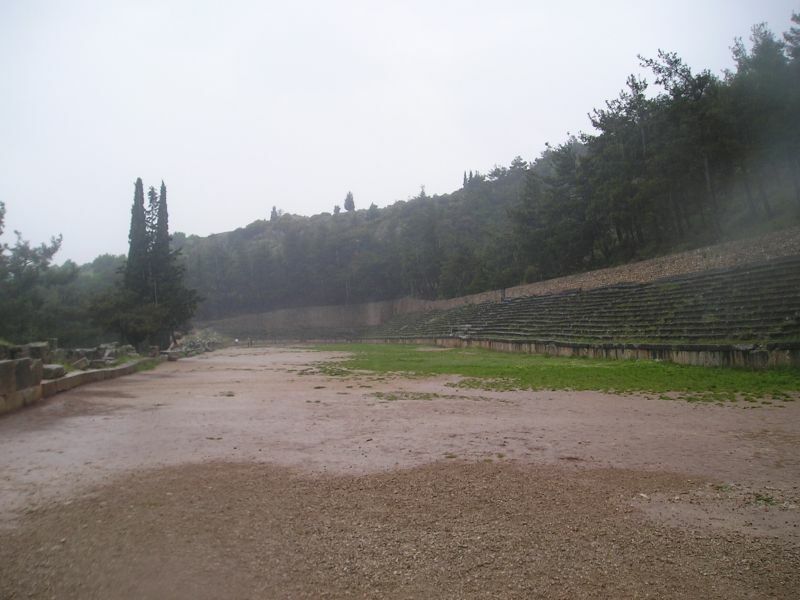 A road crew, or a series of road crews, either too lazy and/or greedy to find gravel that wasn’t part of a millenia-old, irreplaceable structure, or too ignorant to know what they were demolishing? 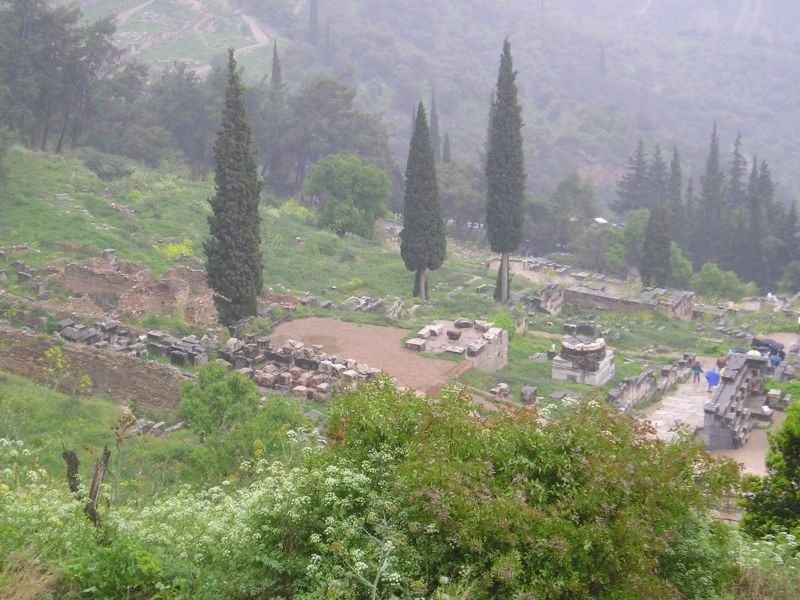 A crime against cultural heritage that could have been avoided without breaking a sweat? Wars destroy things. Salafis are taught to attack Sufi shrines. But this? This was just pointless greed, laziness, and stupidity. It served no purpose, even a disagreeable one. It’s not even destruction for destruction’s sake; it’s just destruction because we’re too dumb to do anything else. 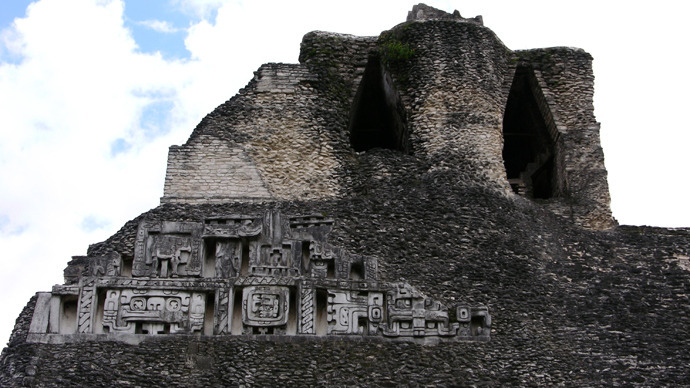 Belize’s deputy prime minister is calling for prosecutions; I’ll believe it when I see it, and anyway no amount of legal action is going to bring this incredible temple back. It survived 2300 years on this planet but couldn’t survive human greed and human stupidity. 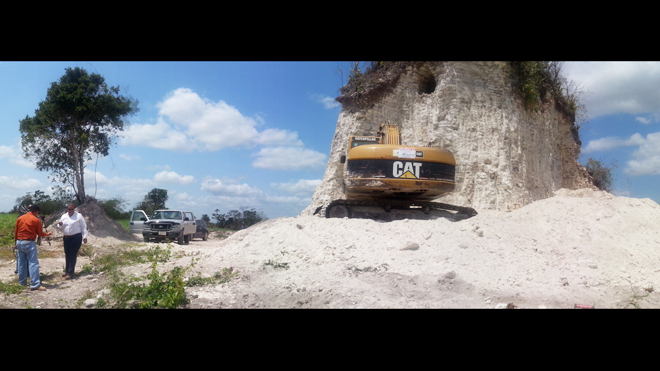 I hope the damn road they paved with these stones was really majestic.